There are an overwhelming number of options when it comes to cycling jerseys for women. But if you’re looking for something unique, original, and perhaps vintage/classic, then Retro2Ride.com is good place to start. Well known for its exclusive and creative designs, Retro2Ride.com offers a lot of unique and stunning cycling jerseys for women, making them standout among the rest. Aside from artistically-designed and thematically-schemed cycling jerseys, Retro2Ride.com also addresses the rigorous demands of high-end cyclists as far as comfort, performance, and durability is concerned. As a result, you can find fashion-forward women’s cycling jerseys that don’t sacrifice quality and performance. To give you an idea of some of options that Retro2Ride.com has to offer, below we feature three stunning cycling jerseys for women that you can buy right now on the company’s website. 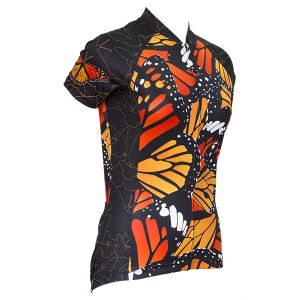 This cycling jersey emphasizes the vibrant and beautiful orange and yellow wings of a Monarch butterfly. The front and back have the overlapping wings of the butterfly; the colors yellow, orange, white, and black are contrasting and at the same time complementing each other. This creative cycling jersey also has the outline of Monarch butterflies in different sizes on its side panel; yellow outline on black background which gives emphasis on the butterflies. And an entire small image of the colorful butterfly is elegantly placed on each of the sleeve. This cycling jersey is inspired by nature. 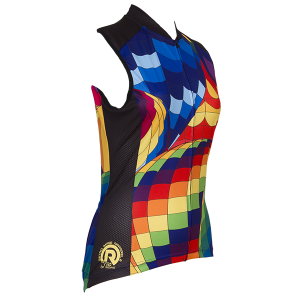 At a glance, you will have the first impression that it is an abstract design, but as you look at it in all angles you will be able to figure out that this cycling jersey is patterned with various designs and colors of interlocked hot air balloons. All of the rainbow colors are present in different shades: red, orange, yellow, green, indigo, blue, and violet. The balloon pattern on this women’s sleeveless cycling jersey stands out like elegant quilted squares (like that of hot air balloon.) 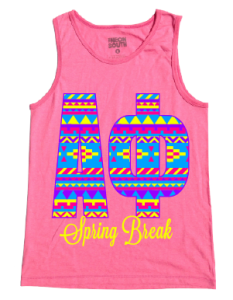 It also has a variety of patterns such as colorful zigzagged lines and diagonal lines. From afar, the jersey looks like a pixelated rainbow that has a warping effect above it. It is indeed a cool design that will surely stand out as one of the most unique and creative cycling jerseys for women. Le Chat Noir is a French term for “The Black Cat” and was a famous cabaret in Paris. This design is inspired by an 1896 poster, made by Salis, that advertised the tour to other cities of Le Chat Noir’s cabaret entertainers. 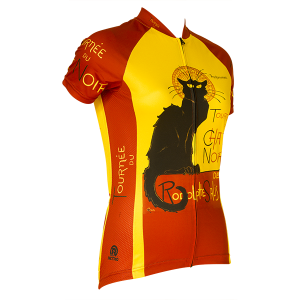 The Chat Noir cycling jersey has the fierce looking black cat, with a yellow background and rustic orange at the bottom and side panels. It has the exact words on the poster “Tournee du Chat Noir de Rodolphe Salis”, same words are also on the sleeves and sides of the jersey. As one of the most popular women’s short sleeve cycling jerseys, this design was used by the company to celebrate the golden era of creativity. You will definitely love this because it is classic and is a mark of artistry. These cycling jerseys have unique and creative designs indeed. It is also comfortable to wear because of the soft Euro-mesh fabric and quick dry technology that they use for their jerseys. It has silicon gripper band rear that ensures the jersey is in-place as you enjoy your ride. You do not have to worry of the colors fading especially that you have to wash it often because they use dye-sublimation printing. These are just some of the outstanding reasons for you to consider buying cycling jerseys from Retro2Ride.com. Still under the idea that most cycling jerseys will make you look like an ousted member of an eighties rock band? Sure, there are some questionable riding shorts and cycling jerseys on the market at the moment, but some companies are making a novel statement with their designs. Unlike the logo-monkeys with elaborate cycling jerseys with sponsors they don’t actually have, you can rep something original and authentic from Retro Two. 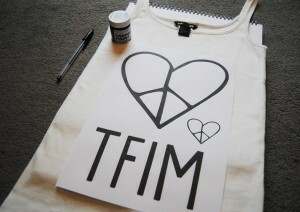 Officially Retro Image Apparel Two, Retro Two is making a bold statement in the cycling jersey marketplace. Not only is the known for super comfortable, high-performance cycling jerseys tailored using some of the most premium, moisture-wicking fabric, but Retro Two’s products emphasize unique and novel designs that are sure to stand-out from the pack. Over the past year, the company has been making a name for itself in the cycling jersey market, and with good reason too. Whether you’re a cycling enthusiast seeking a novel jersey with historic value or you want a unique and creative pattern, there are many unique cycling jerseys at Retro Two. We picked a few of our favorites. Check them out below. 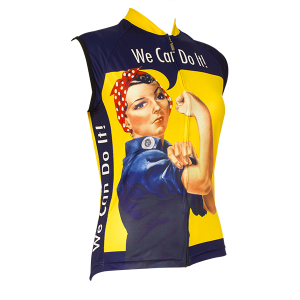 If you’re a woman who’s got a big cycling event coming up – or perhaps you’re doing a bike ride for charity – empower the pack with the Rosie the Riveter cycling jersey. This novelty jersey comes in the original, bright and beautiful color scheme, along with Geraldine Doyle, the 17-year old face from 1943 that provided inspiration for women. This classic cycling jersey from Retro Two comes in long sleeve, short sleeve, and sleeveless. For men that want to take a little bit of history with you on each and every bike ride, then we thoroughly recommend the 1965 Ciclo Cross Men’s Short Sleeve Jersey – one of the most original yet classic cycling jerseys on the site. 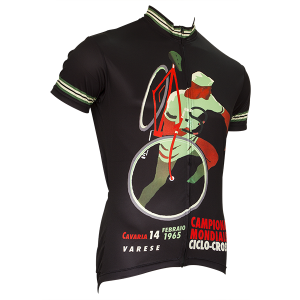 This particular jersey celebrates the 1965 World Ciclo-Cross Championship which took place in Cavaria, Italy, and was won by five time world champion Renato Longo. Now if his impressive 12-year career which gave him a staggering 230 ciclo-cross wins isn’t enough to motivate you to cycle just that little bit harder up that hill, then we don’t know what will. 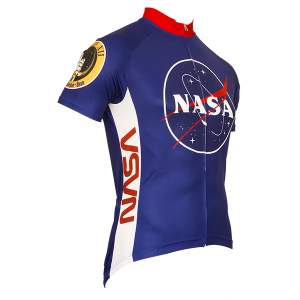 If you love cycling but don’t care too much for the history of the sport, then how about trying the NASA Cycling Jersey for size? No one can deny how strong and powerful America’s space development has been over the years, and this novel cycling jersey will do its part to make you want to achieve bigger things. If man can walk on the moon, you can get through your bike ride, or beat your PR this year. No need to sacrifice your style with Retro Two – explore some of the most unique, inspirational, and novel cycling jerseys online.